You’d be forgiven for thinking from that Critters have to be microscopic. Well, to put the case for all those big Critters out there, take a look at this selection of chunky creatures that don’t need a magnifying glass to find…. 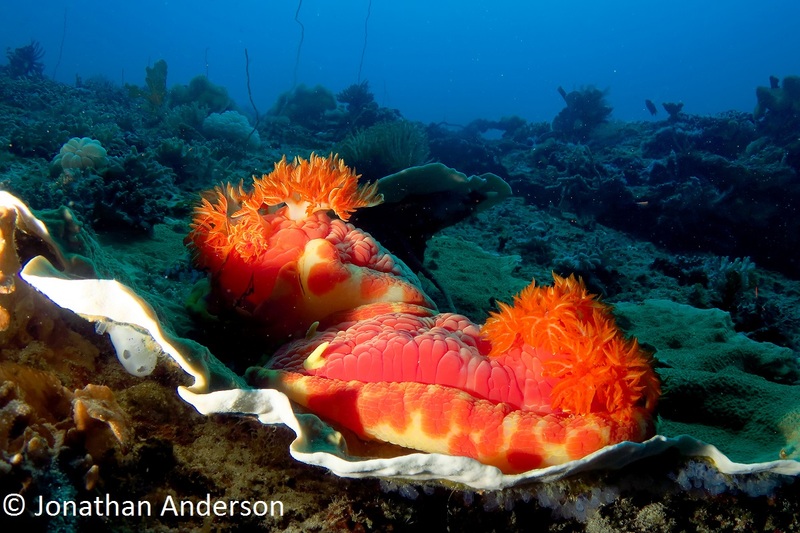 The largest of all Nudibranchs, growing up to the size of a beachball. So called because they resemble a Flamenco dancer when they decide to go for a swim, it’s best not to encourage them to dance if they are not in the mood. When crawling about, they find their way back home by following their own slime trails, but when swimming they are literally flying blind. The Emperor Shrimp (see 5. Shrimps are for life, not just Barbecues) are commonly found living in these plush, garishly upholstered homes. Normally visible only at night, this pair is commonly found out during the day, deep on the south corner of Apo Island. Females of this venomous Sea Snake has been measured at more than 6 feet (1.8m) in length, so easily qualify as a BIG Critter. Their venom is 10 times more powerful than a rattlesnake, but being non-aggressive, with relatively small fangs, the only recorded fatalities seem to be among those trying to catch them for food or skin, or from fishermen trying to clear them from their nets. 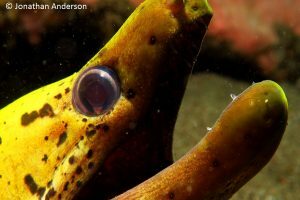 Often seen shadowed by other predators fish such as Jacks or Trevallies, they hunt small fish and eels in coral crevices, flushing out other prey for their accomplices to feed on. 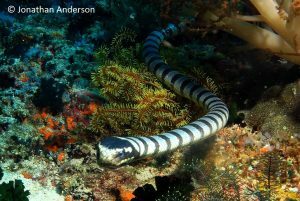 The Banded Snake Eel mimics the Sea Krait to ensure it remains unmolested by all, except the Sea Krait, who seem to know the difference. 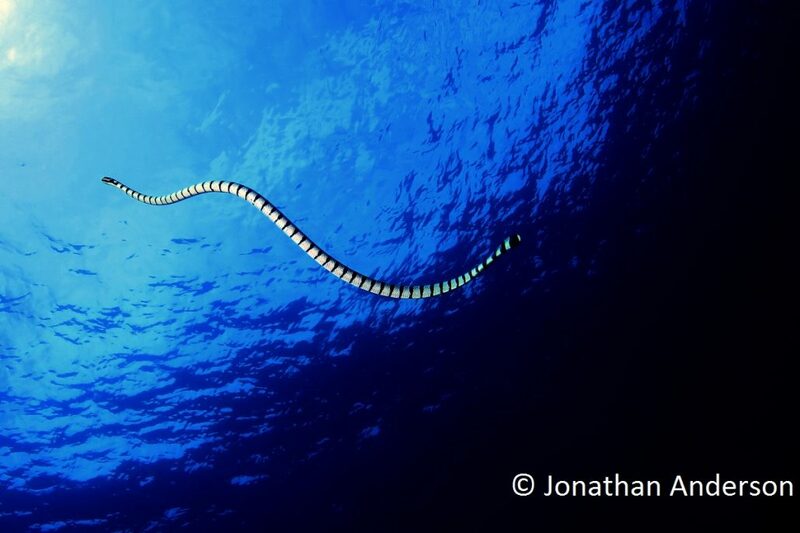 Sea Kraits are reptiles that need to return to the surface to breathe, and watching them undulate to and from the surface is just about as mesmerising as diving gets. 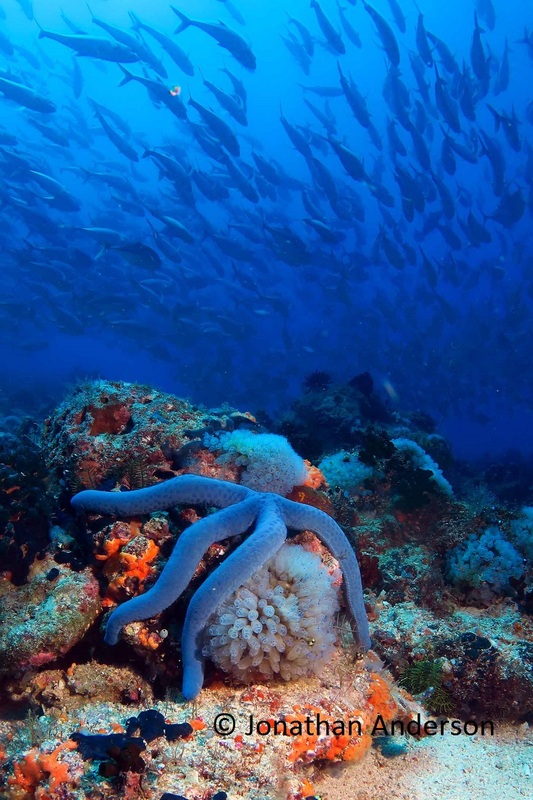 Growing up to 2 feet (60cm) from tip to tip, the Blue Sea Star is a common enough sighting along the Dauin coastline. 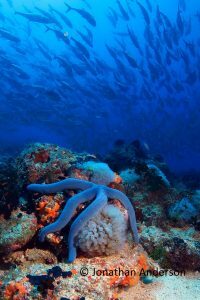 What is most uncommon, is its ability to shed one of its arms, called ‘comets’ by the biologists, which then grow 4 more arms of their own, and turn into a new Blue Sea Star. This ability to shed an arm (known as Autotomy) is also handy if you are trying to get away from a predator; presumably a slow moving one in the case of the Blue Sea Star. Although there seem to be plenty of these Critters around Dauin, their popularity in the aquarium hobby trade, and dried as jewelry ornaments and home decorations is putting them in danger of being wiped out in some areas. Best leave them where they are keeping the algae growth under control on the reef. Getting on for 4 feet (1.2m) in length, this eel, also known as the Spot-Faced Moray, is a nocturnal predator of small fish and crustaceans. Like all Moray Eels, the Spot-Face has two sets of teeth – the daggers at the front of their jaws for hooking prey, and an interior set of Pharyngeal jaws, like those of the Alien in the sci-fi classic of the same name, that shoot forward and pull their meal down their throats. Teamed up with a mouth full of some pretty nasty bacteria, their morning breath must be truly horrific. We all know someone like that.